By Torun Wallgren, Anne Larsen and Stefan Gunnarsson, 2019. Animals 210: 26-37. Special Issue Environmental Enrichment of Pigs. 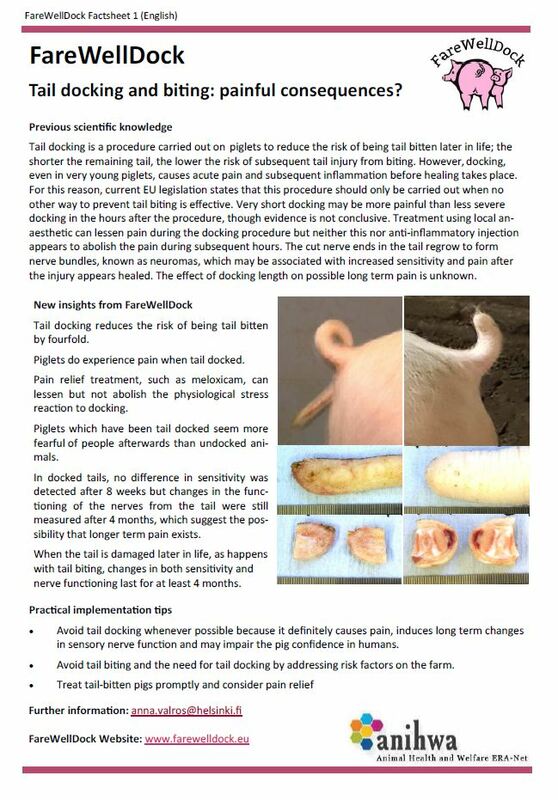 Tail biting is a large welfare problem in modern pig production, causing pain and reduced health and production. The identification of tail biting is important for minimising the risk of the escalation of the behaviour and its consequences. Tail posture (i.e., tail hanging or curled) has been suggested to depend on the presence of tail wounds and, therefore, has been suggested as an indicator of tail biting. This study investigated the relationship between tail position and tail damages at feeding, since that could be a feasible time for producers to detect tail posture. The experiment showed that 94% of the pigs had curly tails and that pigs with wounds were more likely to have hanging tails than pigs with nondamaged tails. By observing the tail position at feeding, we were able to identify pigs with tail wounds in 68% of cases simply by scoring pigs with hanging tails. To conclude, the scoring of pigs with hanging tails at feeding was found to be a useful tool for identifying tail damages, which may otherwise be difficult to detect by the caretaker. Tail posture (i.e., hanging or curled) has been suggested to be an indicator of tail biting, and hanging tails predisposed to damage. The aim of this study was to investigate if tail posture was feasible as a tail damage indicator in a commercial setting. The study was carried out on one batch of 459 undocked finishing pigs (30–120 kg in weight). Weekly scoring of tail posture was combined with the scoring of tail lesions. Tail posture was observed at feeding to facilitate the usage of the method in commercial settings. A curly tail was observed in 94% of the observations. Pigs with tails scored with “wound” were 4.15 (p < 0.0001) times more likely to have hanging tails, and pigs scored with “inflamed wounds” were 14.24 (p < 0.0001) times more likely to have hanging tails, compared to pigs with nondamaged tails. Tail posture correctly classified tails with “wound” or “inflamed wound” 67.5% of the time, with 55.2% sensitivity and 79.7% specificity, respectively. The method of observing the tail position at feeding seems useful as a complement to normal inspection for detecting tail biting before tail wounds are visible to the caretaker. Wallgren, T. R. Westin and S. Gunnarsson, 2016. A survey of straw use and tail biting in Swedish pig farms rearing undocked pigs. Acta Veterinaria Scandinavica 58:84. Background: Tail biting is a common problem in intensive pig farming, affecting both welfare and production. Although routine tail docking is banned within the EU, it remains a common practice to prevent tail biting. Straw as environmental enrichment has been proposed as an alternative to tail docking, but its effectiveness against tail biting and function in manure handling systems have to be considered. The aim of the study was to survey how pigs with intact tails are raised and how tail biting is handled in Sweden, where tail docking is banned through national legislation. 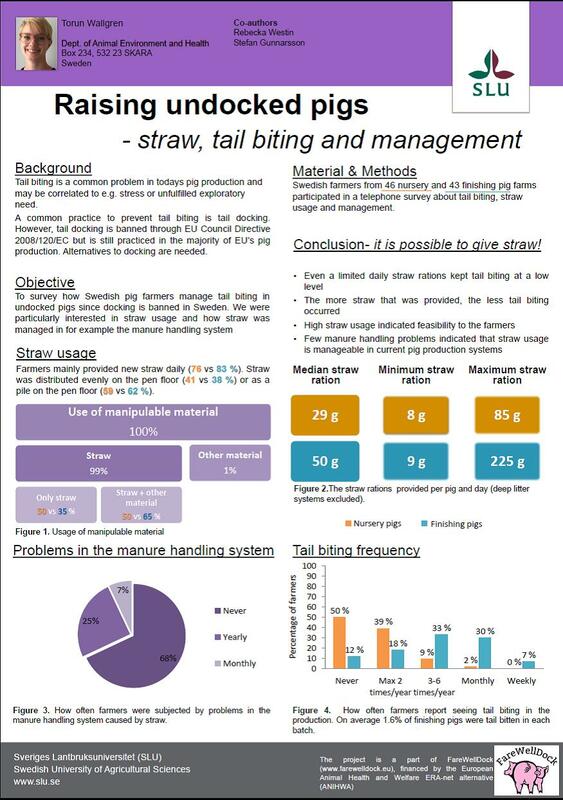 The study emphasises straw usage and its association with tail biting pigs and problems in the manure handling system. The expectation is that this information could be conveyed to the rest of the EU to reduce the need for tail docking. Results: In a telephone survey of randomly selected Swedish pig farmers (46 nursery and 43 finishing pig units) with at least 50 sows or 300 finishing places, it was found that straw was used by 98% of the farmers. The median daily straw ration provided was 29 g/pig for nursery and 50 g/pig for finishing pigs in systems with partly slatted flooring. The reported prevalence of tail biting was 1.6% at slaughter. The majority of farmers reported that they never had manure handling problems caused by straw (56% of nursery units and 81% of finishing pig units). A proportion of farmers (37%) also provided with additional material apart from straw on some occasions, which may have affected tail biting prevalence and manure handling problems. Conclusions: Swedish farmers rear undocked pigs without large problems with tail biting. Straw is the main manipulable material used, and additional manipulable material is used to various extents. The low incidence of straw obstructing the manure handling systems implies that it is indeed possible to use straw in partly slatted flooring systems, reducing the need for tail docking. The impact of using additional manipulable material is unknown and requires more investigation to separate the impact of such material from the impact of straw. 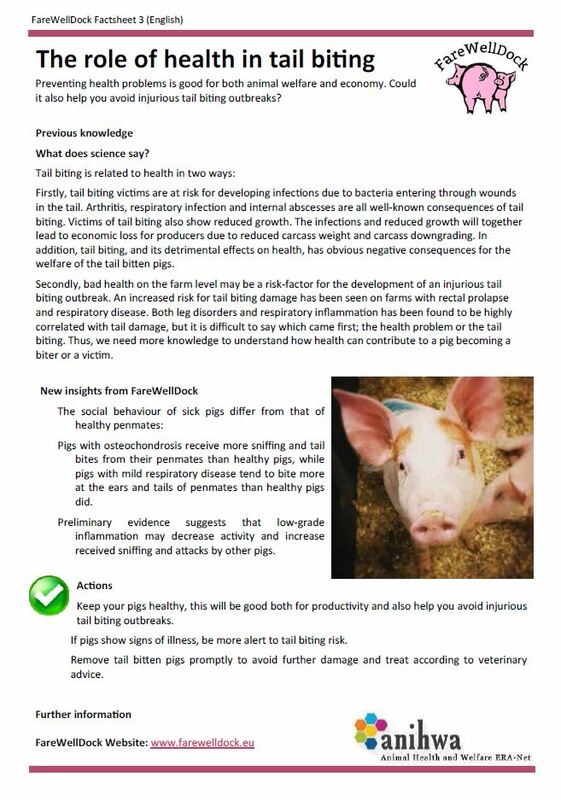 Tail biting is a common problem in todays’ pig production, affecting production and welfare. As tail biting behaviour is more prominent in systems with no or limited access manipulable material, it has been considered related to exploratory behaviours. Tail docking, commonly used as tail biting prevention, is a painful procedure that can decrease pig welfare does not eliminate the tail biting behaviour. Although tail docking is not accepted as a routine procedure according to the EU Directive 2008/120/EC it is still a common practise within the EU, which is why other measures to reduce tail biting behaviour are needed. In Sweden, tail docking is banned and tail biting must be reduced otherwise. Furthermore, Swedish legislation banned fully slatted floors and demands pigs to have access to manipulable material. In order to investigate the prevalence of tail biting in Sweden and the relationship with provision of straw, we performed a telephone survey in nursery (n=46) and finishing pig (n=43) farms. Farmers were interviewed regarding straw usage (e.g. daily ratios) and tail biting (e.g. frequency). All participating farmers gave access to manipulable material and 98% used straw. The median straw ration reported by farmers was 29g/pig/day (min: 8g, max: 85g) in nursery and 50g/pig/day (9g, 225g) in finishing farms when excluding deep litter systems. Farmers reported having observed tail bitten pigs, at any time, in 50% of nursery and 88% of finishing pig farms. Of these, tail bitten pigs were reported to be found ≤2 times/year (78%), 3-6 times/year(17%) or monthly (4%) in nursery and ≤2 times/year (21%), 3-6 times/year (37%), monthly (34%) or weekly (8%) in finishing farms. Finishing farmers reported on average 1.6% tail bitten pigs/batch (0.1-6.5%), which is in line with abattoir data. Spearman rank correlation was used for statistical analysis. Increased straw ration was correlated with decreased reported tail biting frequency in finishing farms (r=-0.39, P=0.03, n=31), and a tendency for this was found in nursery farms (r=-0.33, P=0.08, n=29) when deep litter systems were included. In finishing farms, excluding deep litter systems, an increased tail biting frequency observed by farmers was correlated to the percentage of tail bitten pigs (r=0.64, P=<0.001, n=33), indicating that an increased frequency of tail biting reported may be associated with more pens affected at outbreaks. Even though provided straw rations were quite small (i.e. 30-50 g/pig/day), this amount of straw may provide pigs with enough occupation to limit tail biting outbreaks. We conclude that tail biting can be kept at a low level (ca 2%) in partly slatted flooring systems, without tail docking, by supplying straw. Tail biting in pigs is common in pig production and has been suggested correlated to several behaviours. It is associated with reduced welfare and production losses. A common practice to reduce tail biting within EU is tail docking where part of the tail is removed; a painful procedure that does not eliminate the behaviour. According to the EU Directive 2008/120/EC routine tail docking is banned and other measures to reduce tail biting must replace docking. An alternative is to improve the pig environment by using straw and thus decrease development of tail biting. Straw usage has been difficult to implement since it is argued that straw provision is incompatible with fully slatted floors. In Sweden, tail docking and fully slatted floors are completely banned through national legislation. Furthermore, it is a legal requirement that pigs should have access to manipulable material. The implementation of straw usage in Swedish farms was investigated in a telephone survey to study straw usage and farmers’ opinion on straw impact on tail biting and farm management. A total of 46 nursery and 43 finishing farmers were interviewed, all reporting providing pigs with enrichment material, most commonly straw (98%). Median straw rations provided in systems with partly slatted floor was 29 g/pig/day (8-85 g) in nursery and 50 g (9-225 g) in finishing farms. Straw was the only manipulable material in 50% of nursery and 65% of finishing farms while remaining farms used additional material, most commonly wood shavings (65%). ‘Toys’, e.g. balls and ropes, were used by 13% of nursery and 16% of finishing farmers as a supplement to other manipulable material. Of these, 62% only provided these ‘toys’ occasionally, e.g. at re-grouping or when tail biting had been observed. Problems in the manure handling systems caused by straw had occurred in 32% of the farms, of these 25% had problems at yearly and 7% monthly, or more seldom (58%). Tail biting had been observed in the production at least once by 50% of nursery and 88% of finishing farmers, an average of 1.6% finishing pigs were reported tail bitten per batch (0.1-6.5). Tail biting was observed ≤twice/year (78%) 3-6 times/yr (17%) and monthly (4%) by nursey and ≤2 times/yr (21%), 3-6 times/yr (37%), monthly (34%) and weekly (8%) by finishing farmers. The provided amounts of straw seem to be sufficient to keep tail biting at a low level in undocked pig herds (<2%/batch). The low incidence of straw obstruction in manure handling systems reported also implies that straw usage at this rate 30-50 g/pig/day) is manageable in pig production systems. 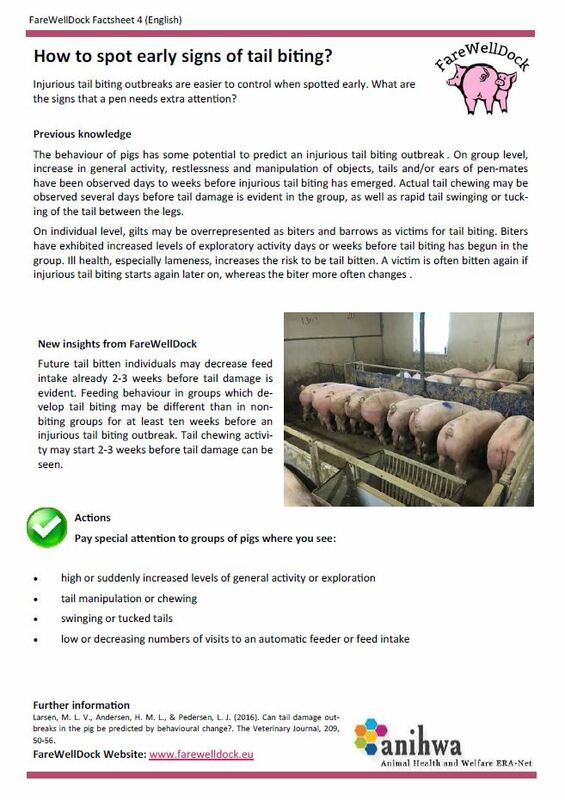 Tail biting is a common cause for reduced welfare and production rates within commercial pig production and is more prominent in barren environments. Using enrichment as straw has been shown to reduce tail biting behavior and thus reduce need for tail docking. Implementation of straw in practice has however partly default since it is argued that straw will cause obstruction in the manure handling systems. Sweden has a long tradition of rearing undocked pigs with access to straw due to national legislation banning docking and fully slatted floors while demanding access to manipulable material for pigs. We surveyed 60 randomly selected Swedish nursery and finishing pig farmers’ usage of straw and their opinions on straw impact on tail biting and manure handling management. All farmers provided manipulable material, 98% straw. In 50% of nursery and 35% of finishing farms the straw was complemented with material such as wood shavings. Straw rations were 29g/pig/day (8-85g) in nursery and 50g (9-225g) in finishing farms. Straw was commonly chopped (76%) to a mean length of 6 cm (1-10) in nursery and 8 cm (1-20) in finishing farms. Straw causing problems in the manure handling system occurred in 32% of the farms who experienced this yearly (25%) or monthly (7%). Most common causes were straw making the slurry sluggish, stacked in pivot or blocking slats. The low incidences of problems indicate current systems are able to cope with presented straw rations. Tail biting had been seen at least one time ever in 50% of nursery and 88% of finishing farms. Frequency of observed tail biting was ≤twice/year (78%) 3-6 times/yr (17%) and monthly (4%) by nursey and ≤ 2 times/yr (21%), 3-6 times/yr (37%), monthly (34%) and weekly (8%) by finishing farmers. An average of 1.6 (0.1-6.5) finishing pigs were reported tail bitten each batch. In partly slatted flooring systems a correlation was found between increased tail biting frequency and percentage of reported tail bitten pigs (r=0.64, P= <0.0001, n=38) (Spearman Rank correlation). The limited tail biting problems indicate that straw usage at this level is enough to prevent major tail biting outbreaks in undocked pigs. Below you find ‘soundbites’ from posters presented at the the conference, all more or less related to the subjects of study in the FareWellDock project. Do increasing amounts of straw increase growing pigs’ oral manipulation of straw? 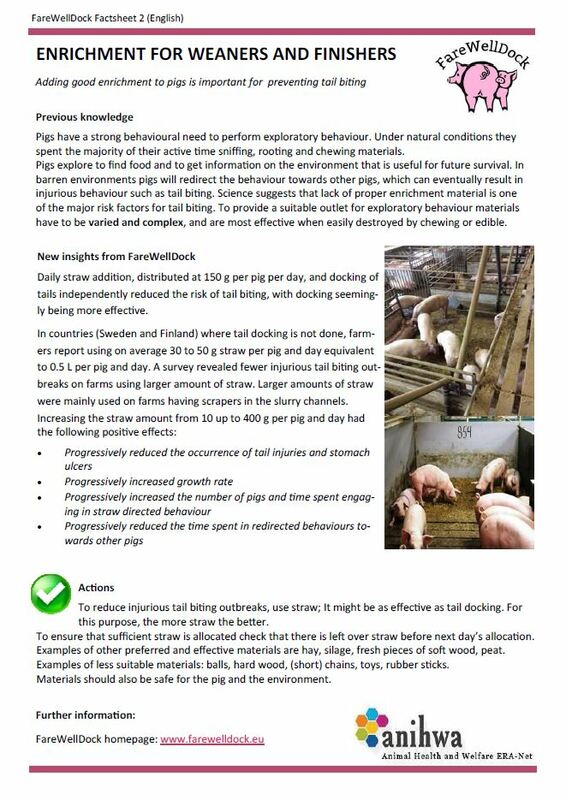 Pigs were provided with various amounts of unchopped straw (10-500 gr/pig/day) to determine the amount of straw where additional provision did not further increase pigs’ exploratory behaviour. Increasing the straw amount from 10 to 360 g straw per pig per day increased the time pigs spent in oral manipulation of straw markedly, while increasing the straw amount above 430 g straw per pig per day had no additional effect . Aim: To quantify the amount of straw needed to achieve health and production effects, we investigated the effect of straw amount on the prevalence of gastric ulcers and production parameters. Animals & housing: In both experiments pigs were housed in groups of 18 per pen, with partly slatted concrete floor (0.7 m2/pig) and fed a commercial dry feed for ad libitum intake. Conclusion: The average daily gain (ADG) increased by 8±17 g/day for every extra 100 g straw added daily (P<0.001) resulting in 42 g higher ADG at 500 compared to 10 g straw provided. The feed conversion ratio was not affected by amounts of straw. The proportion of pigs with ulcerations was reduced by permanent access to straw (7 vs. 33%; P<0.05). Based on these results, production and health parameters were improved by increasing amounts of straw to pigs kept in conventional pens. The high prevalence of moderate tail lesions in a large proportion of batches of slaughter pigs suggests that chronic tail manipulation is a widespread problem. The large variation between batches indicates that there is good scope for improvement in the housing and management of pigs to reduce this behaviour on Irish farms. Given the economic and welfare implications of even moderate tail lesions it would benefit producers to receive information from the factory on such lesions recorded during meat inspection. This could help inform farm management plans and enable intervention before the behaviour escalates into tail biting. The high prevalence of moderate tail lesions in a large proportion of batches of IE slaughter pigs suggests that chronic tail manipulation is a widespread problem (Van Staaveren et al.). The large variation in tail biting between batches indicates that there is good scope for improvement in the housing and management of pigs to reduce this behaviour. It would benefit pig producers to receive information about tail lesions recorded during meat inspection. This could help inform farm management and enable intervention before the behaviour escalates into tail biting (Van Staaveren et al.). Even in well-managed herds in average one out of two pigs is at risk of getting a tail lesion between 7-85 kg (Lahrmann et al., pilot study in DK). The Swedish farmers reported limited problems with tail biting in finishing pigs. In nurseries tail biting was rarely observed. Straw was provided to the pigs more or less daily. Distribution of straw caused no problems with the manure system in 58% of the nurseries and in 81% of the finishing units (Gunnarsson et al.). Dutch Curly Tails project aims at closing the gap between science and practice, and relieving the anxiety and scepticism about keeping pigs with long tails in current systems.